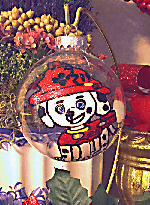 Clearly Susan loves kids and so we were delighted to hand paint Paw Patrol Marshall Dalmation Firefighter Ornaments for all the young ones that love this TV show. 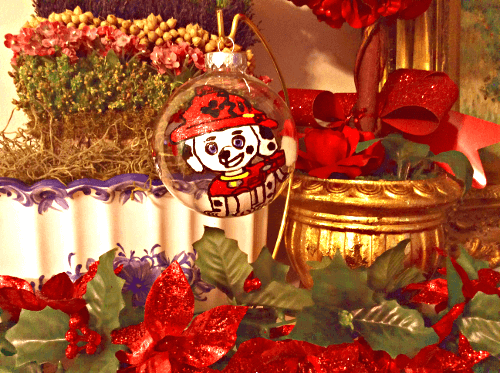 Our Marshall Paw Patrol Christmas Ornaments show this lively dalmation with his true colors and spirit. A bit of a jokester he is very loyal and determined to do his best. Marshall is a dalmatian pup who wears his EMT Uniform with firefighter helmet and a red vest, and red backpack, which features a water cannon (acting as a fire hose). Marshall is a Firefighter who is seen to be silly and clumsy but goes on countless rescue missions where his medical skills are put to practice. He is called "Bad Luck Marshall" from fans, because he is very excitable in which he howls; he is a bit air headed, and not particularly coordinated. Wine Decanter "Tree of Life Design"